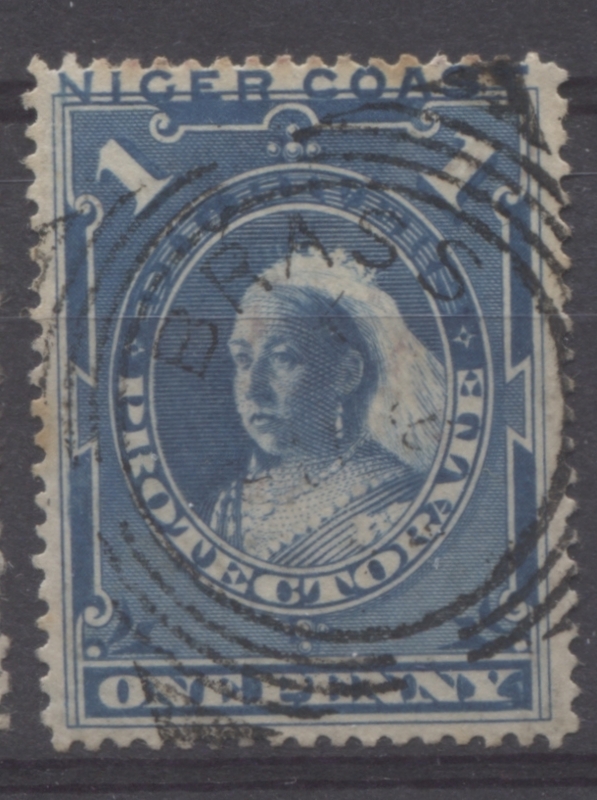 Today I begin looking at the 1d blue from this series. 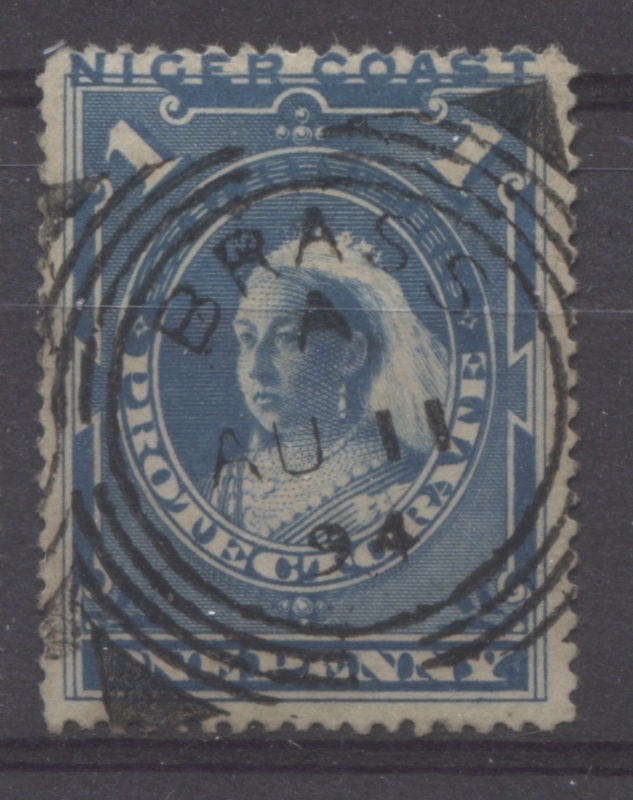 There are too many stamps in my collection for me to cover all attributes in detail in one post. So, I will limit myself today to the shades, the re-entries and plate flaws and then the cancellations. 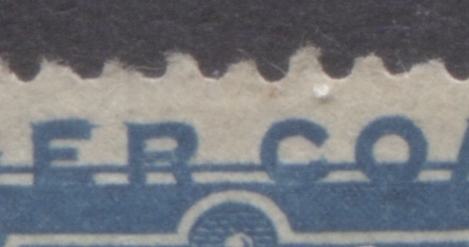 Gibbons lists a pale blue and a dull blue shade for this stamp, though in reality, there are at least 7 shades that I have been able to identify. 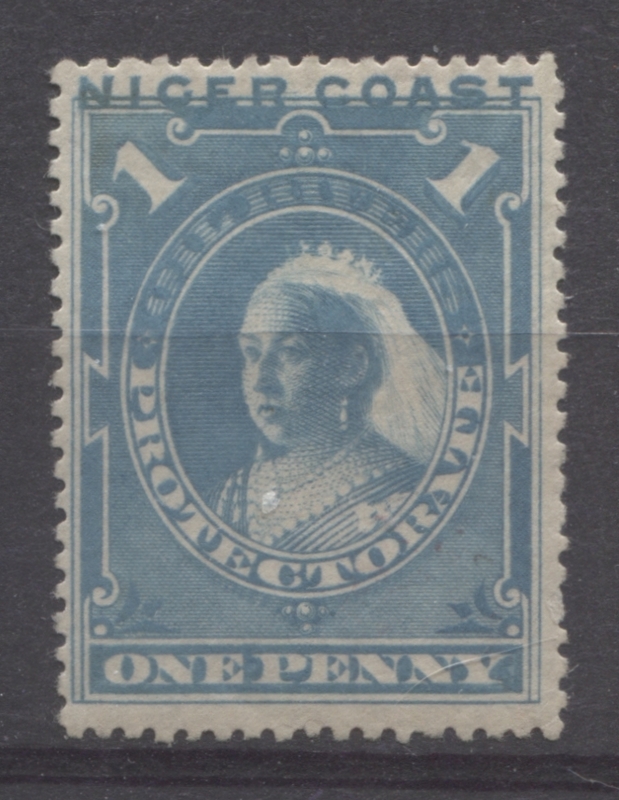 Four of these would be classified by Gibbons as pale blue, while the other three would likely be classified as dull blue. However, it is clear that there should be more shade groups included in the catalogue, since some of the stamps here completely do not fit either shade name. The first stamp on the left is a perfect match to Gibbons's Prussian blue. 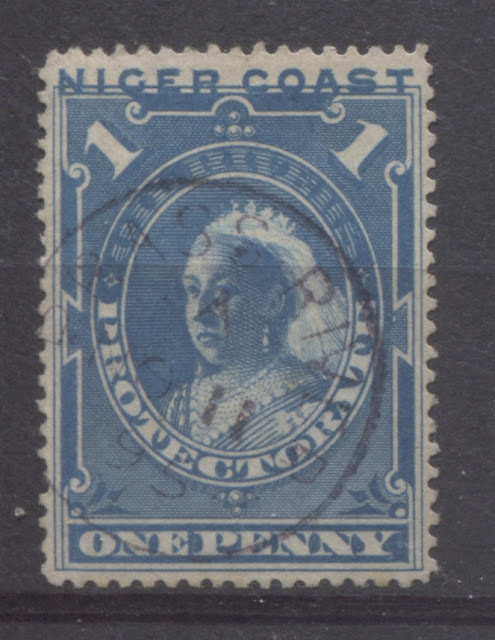 The second stamp from the left is a little brighter, being a very close match to deep dull blue on the Gibbons colour key. 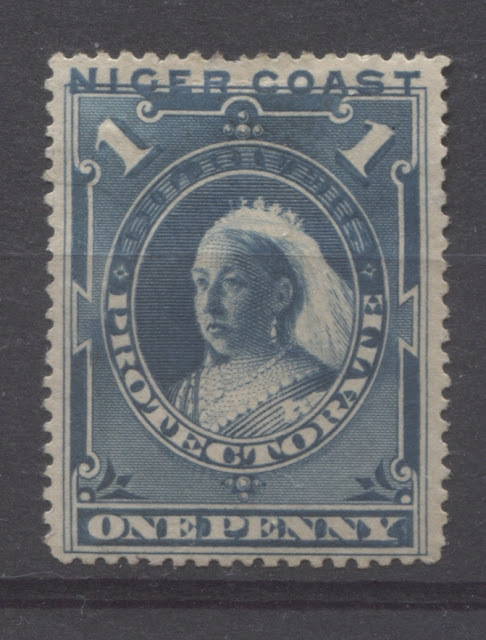 The third stamp from the left is brighter still and a little lighter, being a very close match to Gibbons's dull blue. 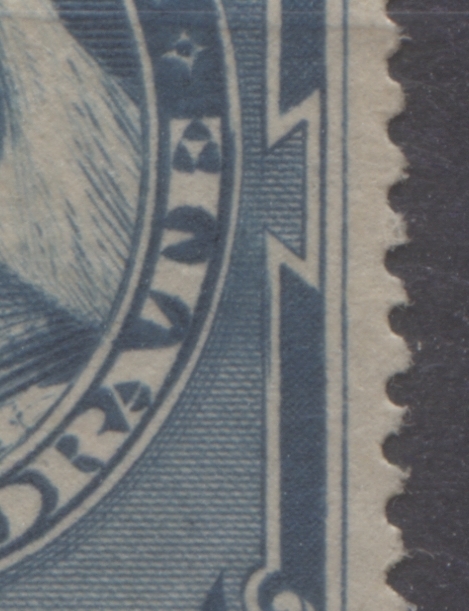 So these three stamps are what Gibbons would classify as dull blue. 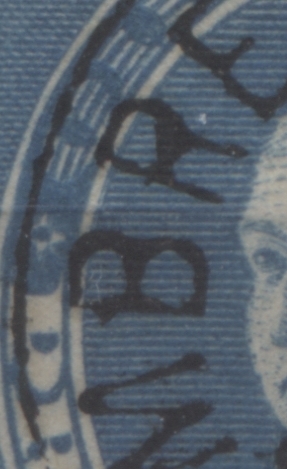 The stamp on the right does not really match any of the colours on the Gibbons key exactly. It is closest to light blue, but is duller and contains a hint more green. This is the first of the shades that would fall under the heading of pale blue in the Gibbons catalogue. 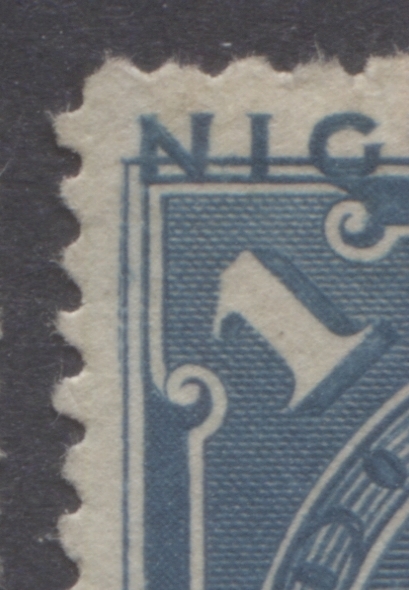 The stamp on the left is very close to Gibbons's light blue shade, except that the colour is a bit deeper. The middle stamp is closest to Gibbons's deep turquoise blue, but is a bit duller. 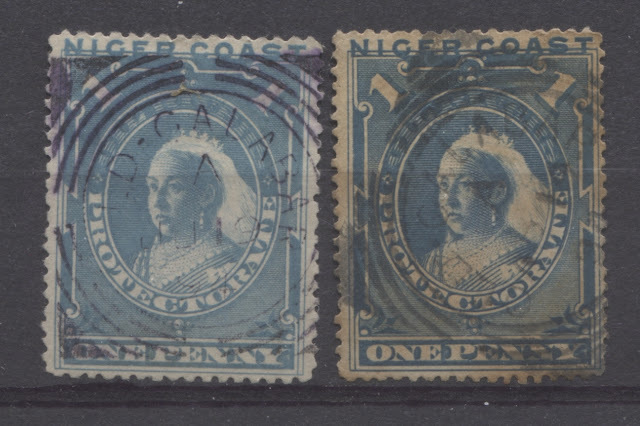 The stamp on the right is very similar to the one on the left, but is just a touch lighter. Ince and Osborne identified 12 plate flaws, re-entries or other characteristic that can be used as the basis for plating these stamps. 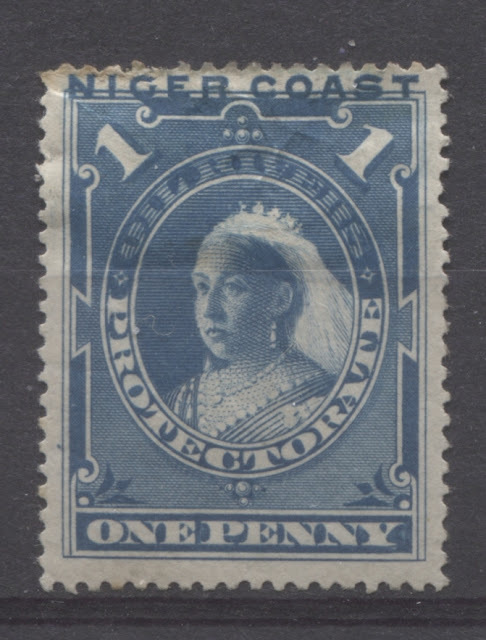 Some of the flaws occur on all stamps or several stamps, making them less useful for identification. However there are six positions that can be positively identified using some of these plate flaws. 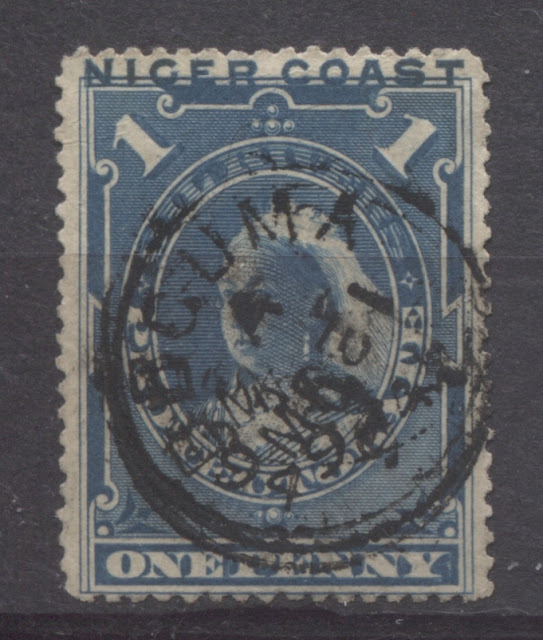 All stamps in the sheet show an additional short vertical line at the top left corner of the picture. Positions 19, 33, 36 and 53: a single line of colour appears in the upper half of the left margin. Positions 13 and 23 a double line of colour appears in the upper half of the left margin. 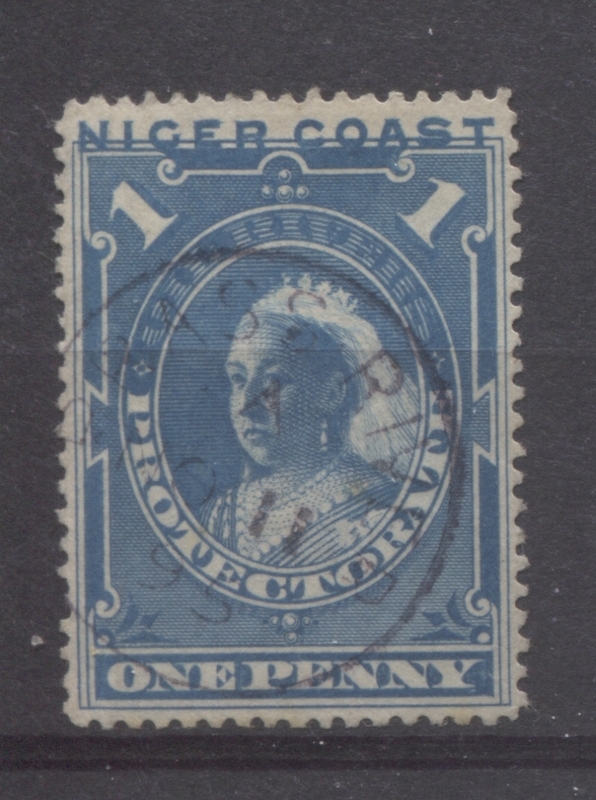 Positions: 3, 6, 8, 10, 20, 25, 42: a graver line extends from the upper arm of the "E" in Niger towards the loop of the "R". Position 12: similar to above except a line extends from the "R" back to the E, and these two lines join up. Position 44: similar to (5), but there is a heavy mark at the top right arm of the E, descending at 45 degrees, resembling a white triangle. 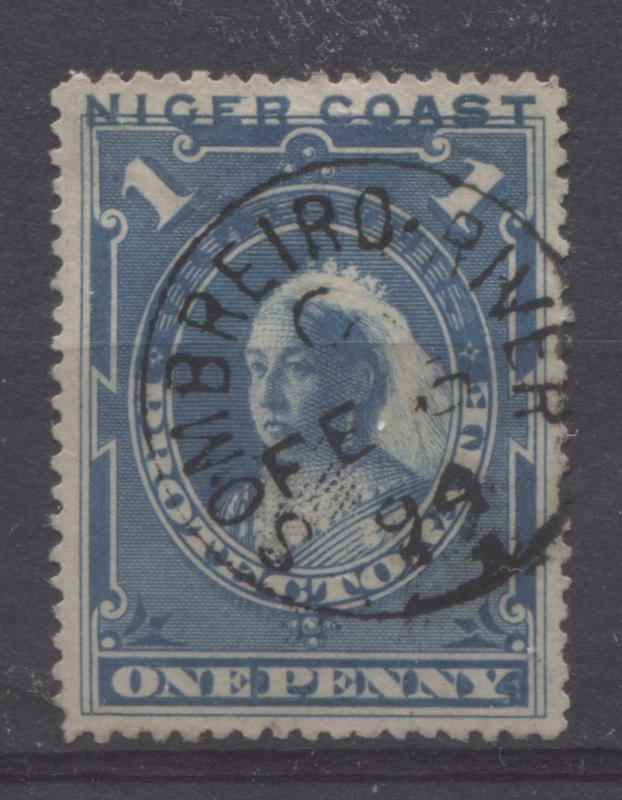 Positions 9, 18, 21, 32, 43, 56 - an extra graving line appears on the right hand loop of the "R" in Niger, towards the "C" of "Coast". Position 30: similar to (7) above, but the line appears midway between R and C.
Position 1: The outer vertical framelines at the top left are increasingly double as they descend. Position 11: Similar to position 1, except that there is also a line of colour in the upper left hand margin descending at 45 degrees. Position 39: two long lines of colour at left, from below N of "Niger", descending at an angle to intersect the outer perimeter line, and continuing down to the margin half way. Position 40: Extra lines to the oval at left and right just below centre. Extra line of colour to the frame at left opposite R of PRO and also on the right of the frame opposite of ATE. 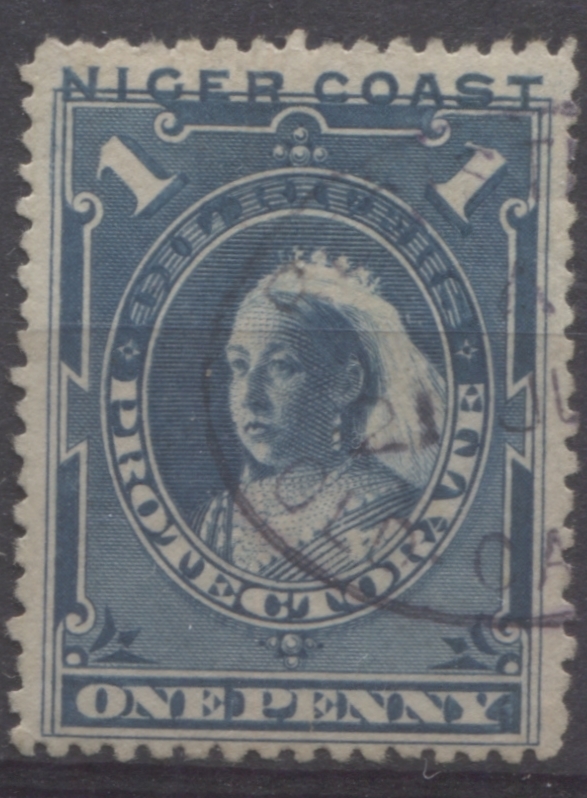 Positions 50 and 60: the oval surrounding the Queen's head has a double line on both sides just below centre. There is also an additional horizontal frameline at the top right corner, and extending to the right. 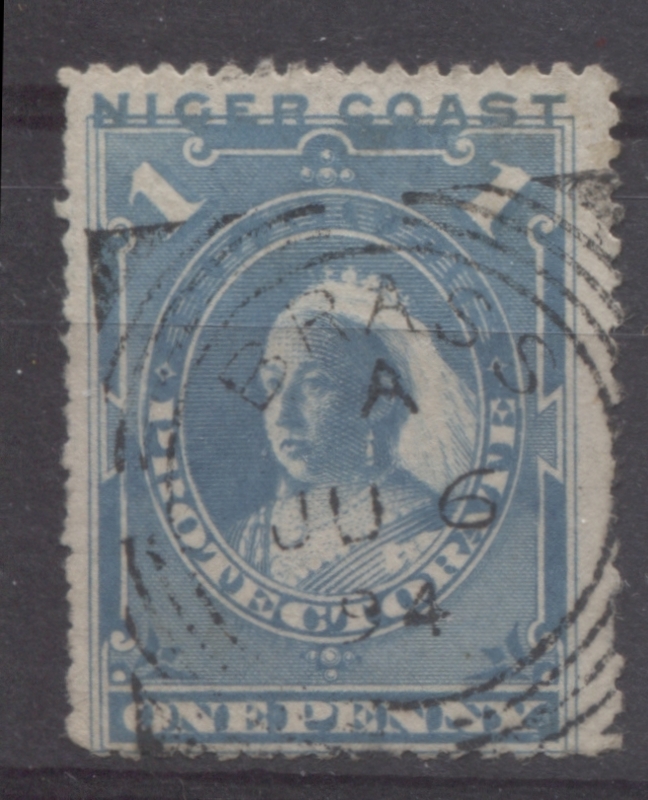 On this position, there is a short horizontal line protruding from the top of the "E" of "Niger". 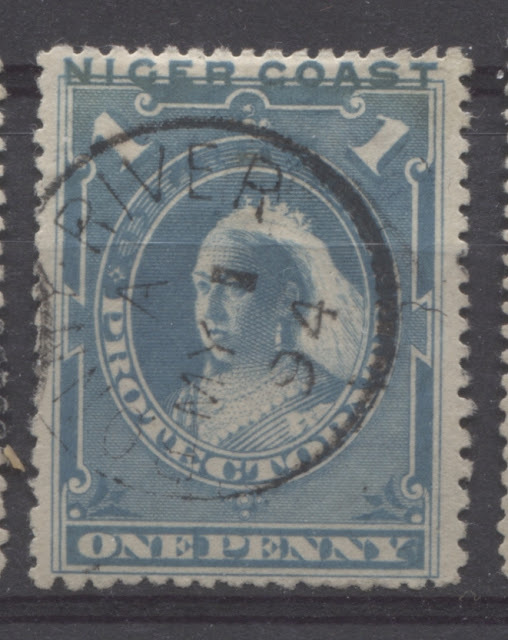 This example happens to be on the only used example I have with a Brass River CDS cancel, from November 11, 1895. As you can see this is a reasonably strong example. 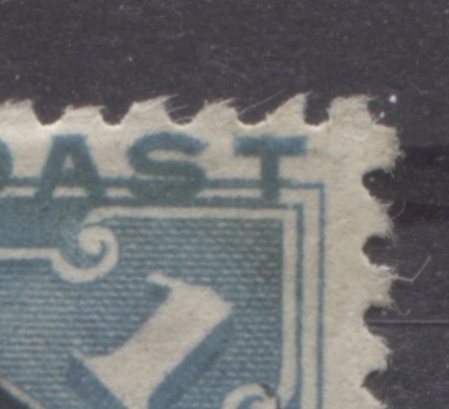 This is similar to the the above, except that in addition to a line from the E towards the R, there is also a line from the "R" back towards the "E", and it almost looks as if these join up. This particular example is especially nice as it occurs on a well centered stamp that has a compound perf, and is cancelled at Sombriero River, at an early 1894 date. 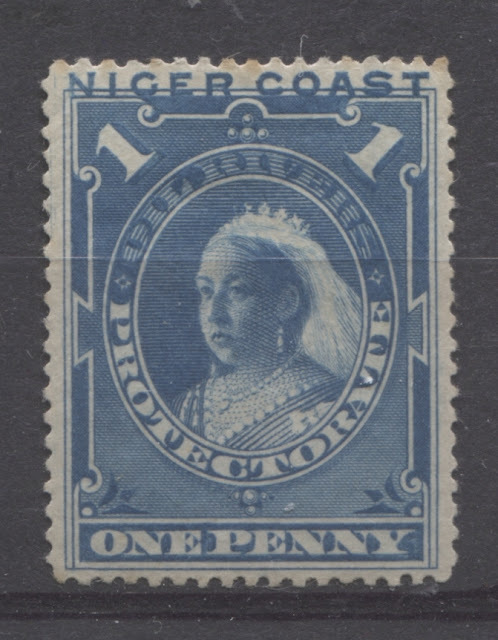 On this position, there is a clear horizontal line emerging from the middle of the "R" of "Niger". 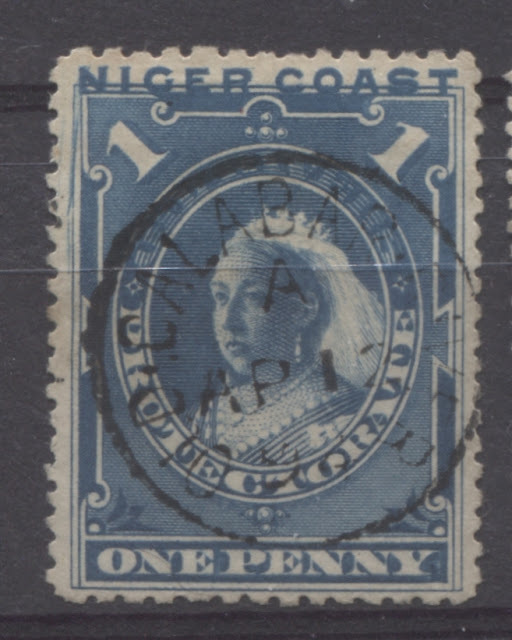 This example is especially nice because it occurs on a stamp with one of the scarcer compound perforations, as we will discuss next week. I have two examples of this position: one in each of the major shades. 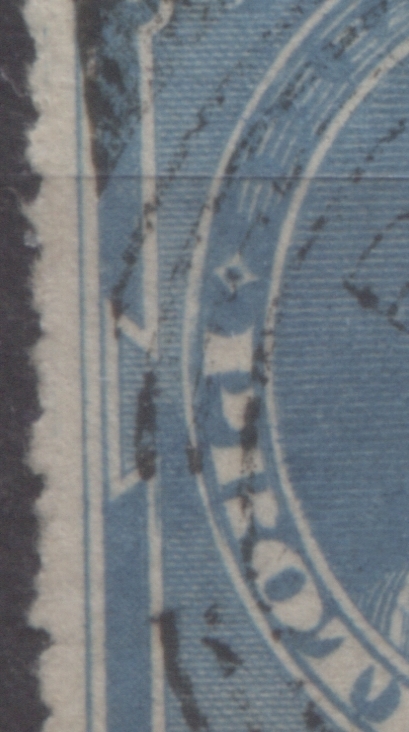 In this position, there is a vertical line of colour in the inner white frameline, just below the first "R" and last "T" of "Protectorate". 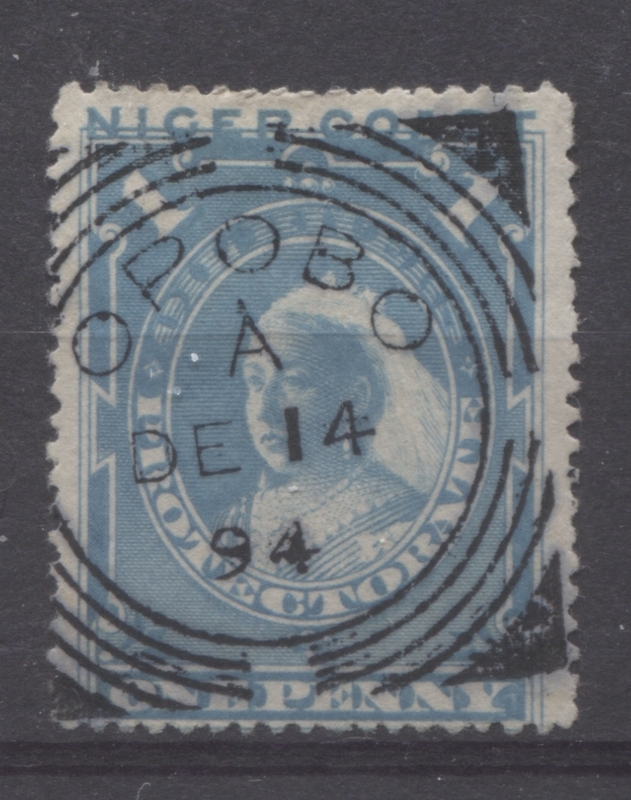 The solid oval is partially doubled below "PRO" and "ATE" of Protectorate. 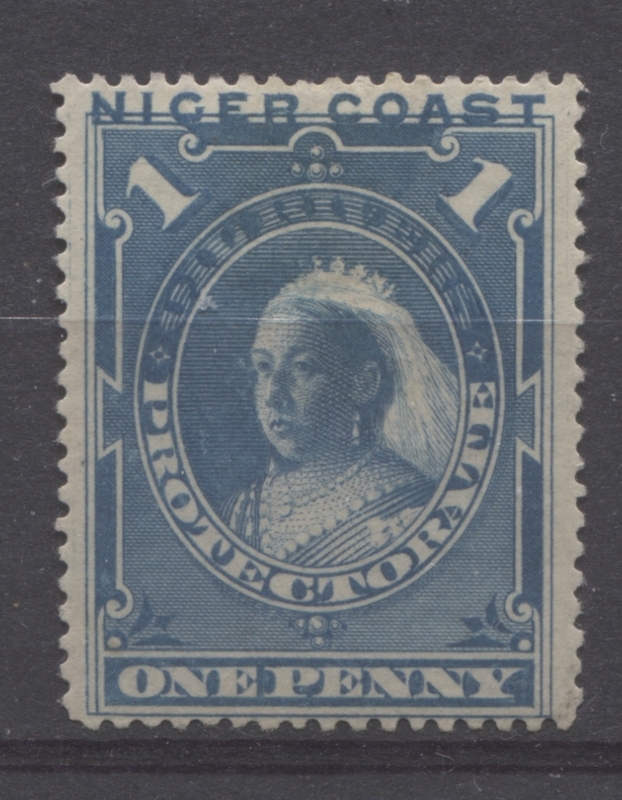 Here is the example in the dull blue shade. 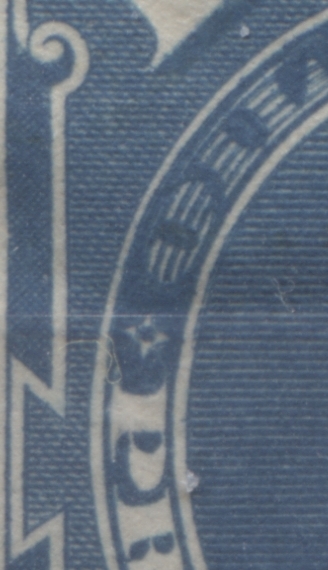 This one should hopefully show the doubling more clearly because the colour is darker. 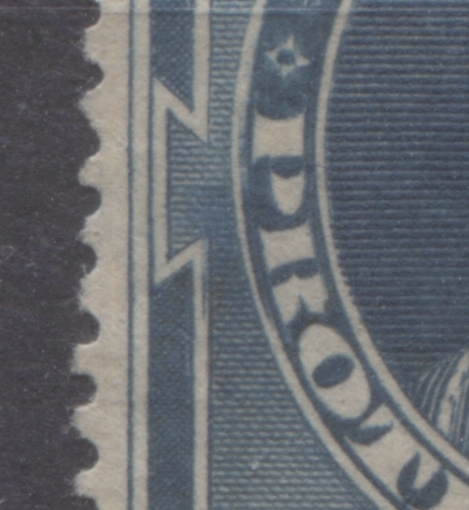 On this first stamp, the horizontal shading lines of the portrait oval protrude ever so slightly into the outer white oval, across from the letters "Prot"
The doubling only occurs on the right side. The doubling of the oval occurs both above and below the letters "ATE". Instead of a vertical line of colour inside the outer frameline, there is a slight extension of some of the horizontal shading lines into this frame. 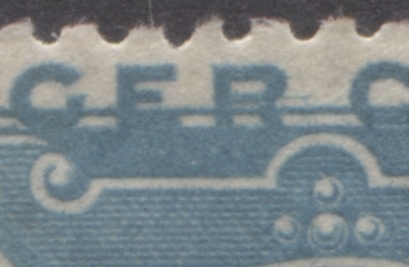 The next stamp shows traces of the same doubling above and below "ATE" on the right side. 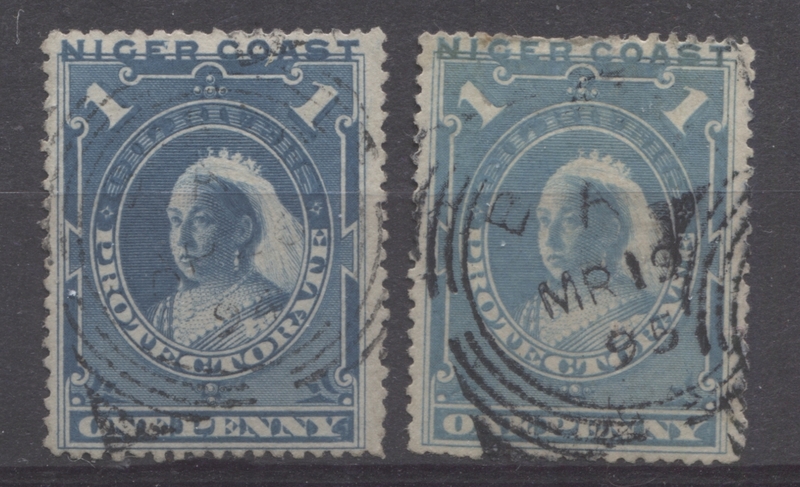 In addition the outer and inner top framelines have been strengthened between the letters "S" and "T" of "Coast". Unlike the other positions that share similar doubling, there is no vertical line of colour in the outer frameline. 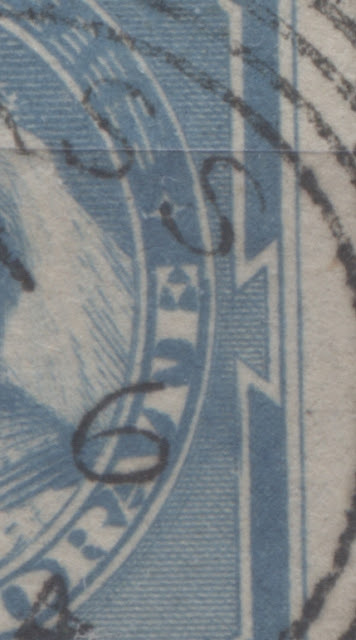 This next stamp is a very minor re-entry in which the horizontal shading lines in the portrait oval extend very slightly into the white oval frame, just across from the star ornament on the left that is below the "O" of "Oil". This village is less common than Old Calabar, Old Calabar River and Bonny, but it is not rare. 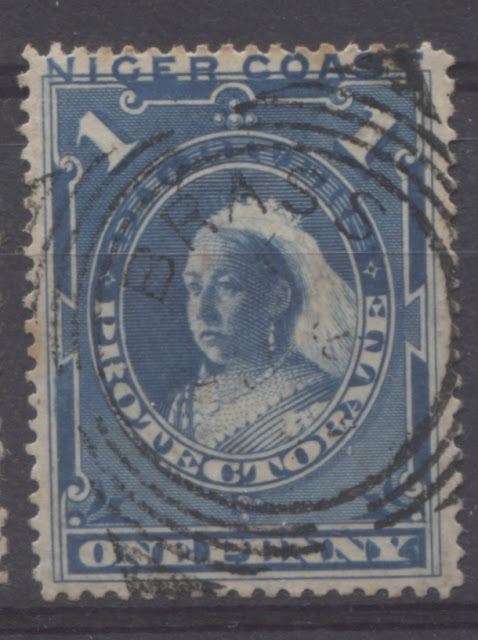 Here, I have one CDS cancellation dated November 11, 1895, which is a little on the late side for this issue, but still within period. This is one of the scarcest of the villages to find cancellations from or this time period. 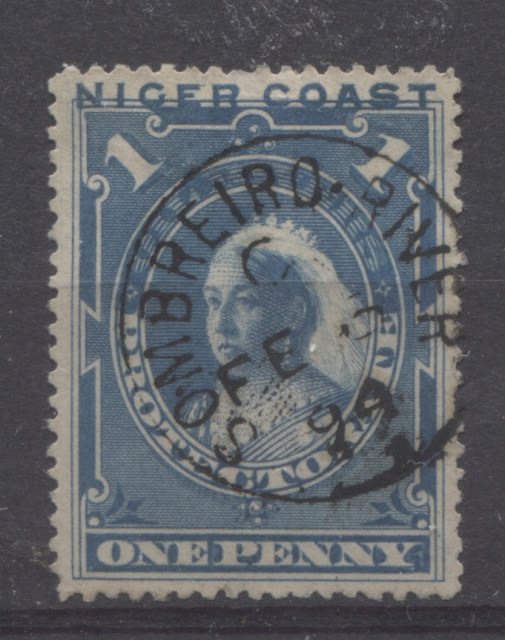 Proud lists any pre-February 22 1897 cancellations as being worth 10 pounds. This cancellation is doubly struck, with one impression being inverted relative to the other. This is one of the more common cancellations for this period. 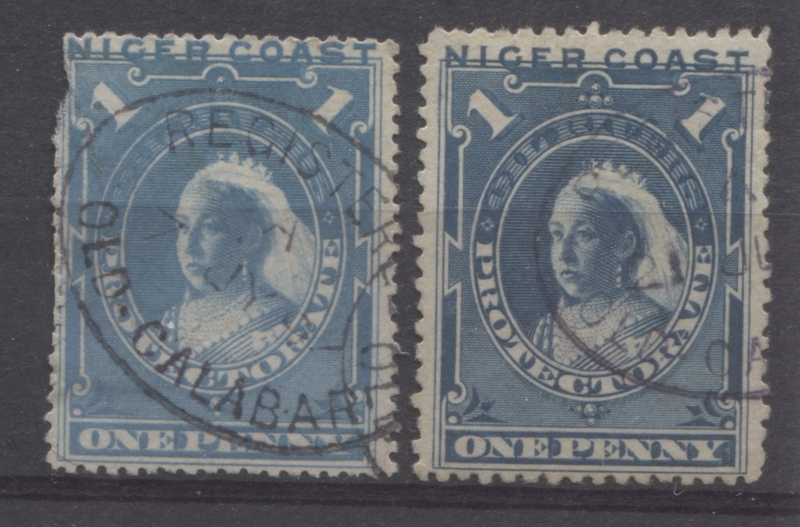 The cancellations for Old Calabar were originally to read "Old Calabar River", but the "Old Calabar CDS was introduced in January 1894. I have five CDS cancellations, two registered oval postmarks, which Proud lists at ten pounds each , and two squared circle cancellations, which Proud lists for six pounds. This is one of the scarcer villages for this issue, and accordingly I have only one squared circle postmark for Opobo, dated December 14, 1894. This lists at ten pounds in Proud. This is easily the one of the scarcest cancels for this issue. Proud lists it as having a value of 250 pounds! 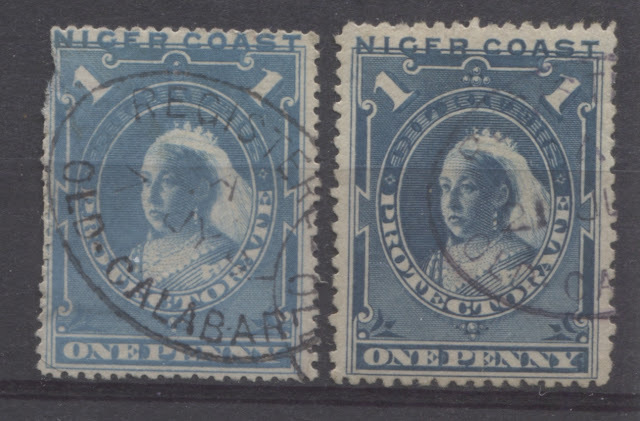 Interestingly, I have many more of these cancellations than any of the other villages, and yet Proud values them at six pounds each. Note that there are some identical dates included in the above selection of 14 stamps. This brings me to the end of this section of the post dealing with the 1d blue. 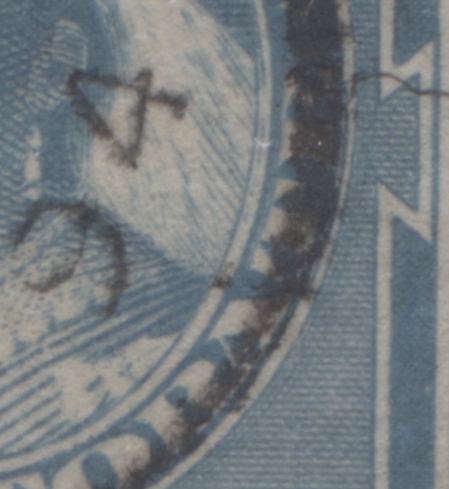 Next week, I will look at the perforations, paper, and gum, before moving on to the 2d value the following week.